From the team’s inception in 1976 until 1999, the Seahawks played at the Kingdome, a multipurpose stadium located on the same site as CenturyLink Field. The Kingdome was also home to baseball’s Seattle Mariners. In the mid 1990s, the Mariners followed the trend of other baseball teams and wanted a new retro ballpark built. A new ballpark for the Mariners would allow the Seahawks to have the Kingdome to themselves. In October 1994, a $120 million renovation plan was announced to upgrade the Kingdome to a football-only facility if the Mariners moved into a new ballpark. However, this plan did not come to fruition and owner of the Seahawks, Ken Behring, wanted to move the club to Los Angeles for the 1996 season after the Rams departed for St. Louis. The NFL opposed the Seahawks relocation and in 1997, Microsoft cofounder, Paul Allen, bought the team. Allen wanted to demolish the Kingdome and build a new stadium for the Seahawks on its site. In June 1997, voters approved referendums for two new stadiums to be built. A new baseball only stadium, Safeco Field, was constructed adjacent to the Kingdome and a new stadium for the Seahawks was constructed on the site of the Kingdome after its implosion. The Mariners moved into Safeco Field in 1999 and the Kingdome was demolished in March 2000. While the Seahawks stadium was constructed, they played at Husky Stadium, home of the Washington Huskies (NCAA). 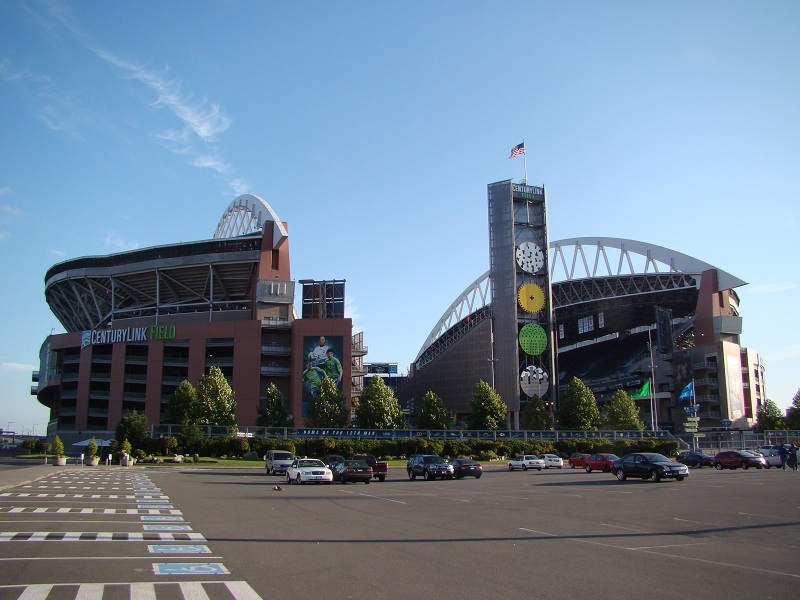 Originally named Seahawks Stadium when it opened in 2002, Qwest Communications International Inc. purchased the naming rights to the stadium in 2004, giving the stadium its name, Qwest Field. In June 2011, the stadium was renamed Century Link Field after the company bought Qwest Communications in April 2011. NFL MVP and Offensive Player of the Year Shaun Alexander in 2005. The Seahawks christened their new state of the art facility on September 15, 2002. Century Link Field is configured in a horse shoe shape, with three tiers of 68,000 seats. The north end of the stadium is open, allowing superb views of the surrounding Seattle area. A 13-story tower with a scoreboard at the top and 3,000 bleacher seats at the base, known as the “Hawk Nest,” is located on the north side. CenturyLink Field was the first stadium to have luxury suites on the field directly behind the north endzone that provides an in-your-face experience. The stadium has a total of 112 luxury suites and over 7,000 club seats. One of the most unique features of the stadium is the overhanging roof design and rainbow tri-chord trusses that rise 260 feet above the field. The roof covers 70 percent of the seats keeping many fans dry during inclement weather. It also reverberates noise created by fans back towards the field making CenturyLink Field one of the toughest stadiums for opposing teams. Outside the facade of the stadium consists of red brick, brick-accented colored concrete, and tan pre-cast concrete and white painted steel for the roofing supports, blending in with other surround facilities. In January 2015 the Seahawks announced the first significant expansion to CenturyLink Field since it opened. Prior to the start of the 2015 season the team added 1,000 seats in the upper level of the south endzone. Known as the Toyota Fan Deck, two new sections of seats flank the area where the 12th Man flag resides. A new 12 Flag Pavilion was constructed to enhance the raising of the flag atop the pavilion. The fan deck features an 8-foot long fireplace, multiple TVs, and food and beverage stands. 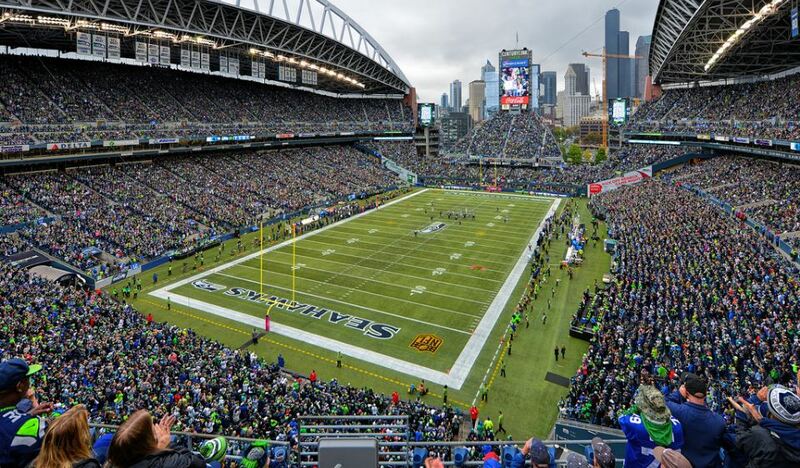 Seating capacity of CenturyLink Field is now just shy of 70,000. Fans attending games at CenturyLink Field have some of the best views than at any other stadium in the NFL from the action of the field to the views of the Seattle skyline. They also have one of the best teams in football as the Seahawks won Super Bowl XLVIII, bringing the first major championship in any sport to the City of Seattle.